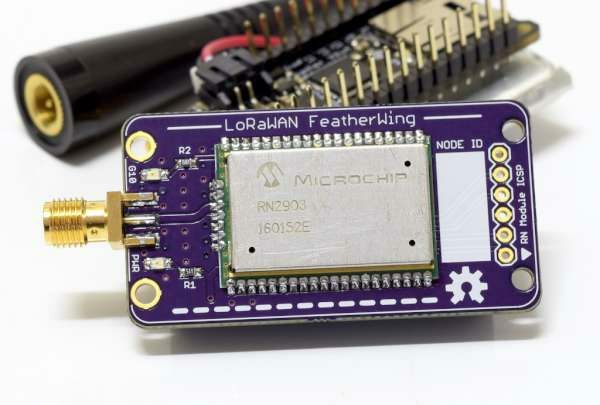 I have designed some FeatherWings in the past to add a LoRa transceiver module to Feather. I did the LoRa FeatherWing Development Breakout and the LoRa FeatherWing IOX that used the HopeRF RFM95/96(W) modules. The RFM modules are small and cheap, which is great for IoT projects. However, they have a limitation if you want to use them with LoRaWAN: the stack is not implemented in the module, leaving that burden to the microcontroller. The LoRaWAN stack takes a fair amount of code space, and it’s difficult to implement in some 8-bit microcontrollers. This new FeatherWing uses the RN2483 (868 MHz) or RN2903 (915 MHz) from MicroChip. It’s an excellent module that fully implements the LoRaWAN stack itself. The microcontroller talks to it over USART with a simple command structure to configure it and send/receive messages. More details at The Sync Channel Blog. This entry was posted on Wednesday, July 13th, 2016 at 3:38 pm	and is filed under wireless. You can follow any responses to this entry through the RSS 2.0 feed. You can skip to the end and leave a response. Pinging is currently not allowed.